Two separate events are receiving a lot of attention in August 2013. They are Elon Musk’s proposedHyperloop transportation system between LA and San Francisco and Google’s Loon project to provide wireless internet access to underserved populations via a network of high altitude balloons. These are both interesting examples of the on-going interplay between visionaries and disruptors of the status-quo, the supporters and enthusiasts who see a potential and the skeptics and critics who point out the inevitable issues, problems and barriers that any radical (and expensive) new artifact will face. What is being played out in a public forum is often what plays out in countless companies and organizations that struggle with how to accommodate the disruptive new concept. Taking the examples of the Hyperloop and the Loon, both of which received significant publicity in mid-2013, one can see the arc of public interest, understanding, speculation, perspective, opinion and belief unfold. Factual reporting on the announcement (BloombergBusinessweek, BusinessInsider, ABC News, The Guardian) evolves into involved explanation and informed analysis (Gizmag, Gigaom, …) which gives way to opinion, both enthusiasm and skepticism (Science Friday, The Guardian, Bill Gates, The Atlantic, etc.) All of this happens within a matter of days, weeks or at most months. It is a hypercharged replica of what takes place within an organization when something gets proposed that pushes the company’s boundaries. What is at play in these discussions of the Hyperloop and the Loon are very different than the regular drumbeats of announcements of ‘revolutionary’ new technologies put out by universities and companies and promoted by the popular press (BigThink, MIT Technology Review, … ). These announcements very rarely get criticized (or even analyzed) but instead fuel the speculative interest bubble fueled by our craving to know what may be possible. It is only when things get more specific that we can start to criticize rather than speculate. 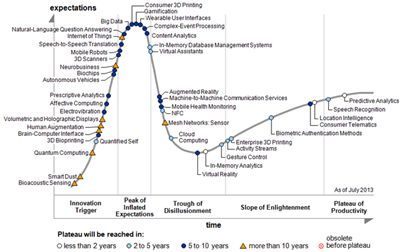 The following chart from Gartner shows a number of technologies mapped along the classic roller-coaster curve. It gives a good sense of this dynamic. As a new concept gets more specific it becomes easier to see all of the issues that need to be addressed in order for the concept to come to fruition. Instead of a singular idea based on often well researched demand and design potential, the concept becomes a complex system of interconnecting components – technological, social, economic, political, etc. 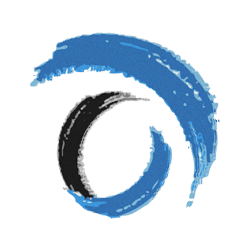 – that create specific problems, barriers and constraints that must be addressed. These are what the critics can point out, and they do – with vigor. It takes strong vision, leadership and an ability to marshal the right resources, address the issues, battle the naysayers and make these new-to-the-world opportunities come to fruition. In this sense, the Loon stands a much better chance since the Google leadership is involved. The Hyperloop, since Elon Musk has turned the concept over to the public, lacks this leadership. Let’s hope someone can step forward and fill this void, otherwise the Hyperloop will become an interesting footnote in history.